After spending weeks trying to find a good Askimet alternative for WordPress, and just when I was about to give up I found Antispam Bee. After trying many different code suggestions, and a number of anti-spam plugins with little or no luck I was skeptical about trying another one. I was actually about to give up and either re-enable Askimet, which I would prefer not to do or take on the tedious task of moderating each and every comment. For some reason I decided to give it another shot. This time with Antispam Bee, and boy am I glad I did. This plugin has reduced my spam by upwards of 90%, maybe even a little more. One of the major benefits to this plugin is it doesn’t need to connect to an external server to do spam checks. 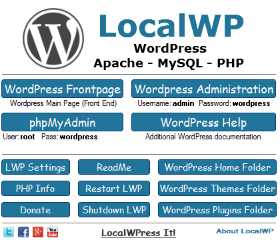 It is done locally on your own server, hosting, or WordPress site. You also have more control over whether you want it to be deleted without even seeing it, or you can set it so you can still inspect comments marked as spam so you can decide whether you want to keep them or not. It also has the ability to integrate and use Project Honey Pot, which is also free to register and use that will do additional spam checks and prevention. It isn’t required, but it can help prevent additional spam. What I have been using is the Antispam Bee plugin with the Project Honey Pot option or feature, and the Growmap anti-spam plugin. 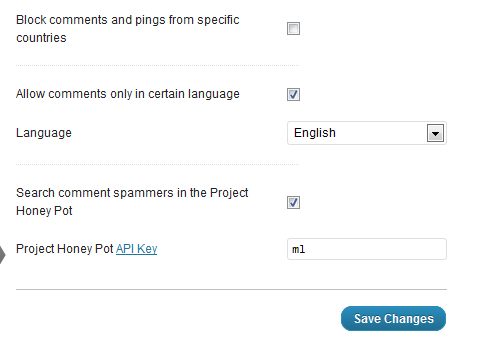 The Antispam Bee plugin has three different setting pages you can configure to your needs. They are general, filter, and advanced settings. It does come pre-selected and most of them are fairly self explanatory. The only thing I have checked is “Consider comments which are already marked as spam” and “Statistics on the dashboard”. The stats on the dashboard really isn’t necessary. I just set mine this way during the testing phase so I could get a quick glimpse of what was going on in my WordPress dashboard. On this page I have “Allow comments only in certain language” checked with English selected. Since I only speak English this will filter comments that are not English. I also have Project Honey Pot enabled, which requires an API Key from Project Honey Pot. You can simply register for a free account. Use a real email address because they send you an automated email, which you must click a link to verify your email address. 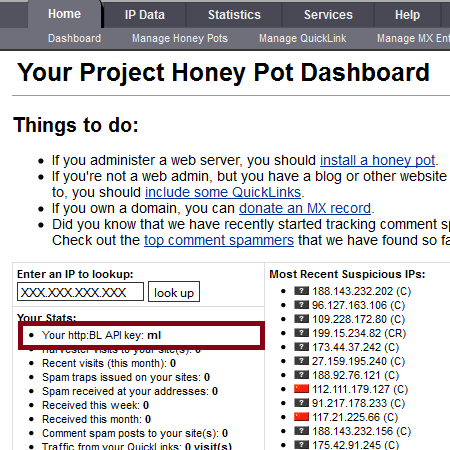 Then, you can login to your Project Honey Pot account. On the dashboard near the top left you can find a link that says something like get/request your API Key. You will then receive a 12 digit API Key that you can just paste into this box. It isn’t required, but use it if you like. I have checked “Mark as Spam, do not delete” This puts comments in your WordPress Spam folder/box automatically so you can inspect them. You should probably use this option for a while until you get a better understanding of how well it is working, and what it is actually marking as spam. If you want it to be automatically deleted you can set the “Spam will be automatically delete after” X days option later. I also have “Hide the “MARKED AS SPAM” note unchecked/unselected because I want to see how Antispam Bee is labeling the comments in my WordPress Spam folder/box. If you decide that a comment is not spam you would want to edit the comment first and remove that line before approving it. Otherwise, it will show up in your comments and it doesn’t look the best to your visitors. If you do not want the [MARKED AS SPAM BY ANTISPAM BEE | CSS Hack] to show up at all then you would just make sure the “Hide the “MARKED AS SPAM” note is checked above. Of course you can pick and choose the options and configuration that works for you. Like I mentioned though, I would set the “Mark as Spam, do not delete” option on the advanced settings page for a while so you can verify and check comments for false positives. I haven’t had any legit comments end up being marked as spam, but I do check to make sure just in case. It is in German I believe, but if you have the Google Toolbar installed in your web browser you can use the translate feature. I translated it to English and most of it becomes understandable. There are a couple of parts that could be a little more detailed, but overall you will find most of it is explained. I have been using Antispam Bee for approximately 2 weeks now, and I have been very pleased with the results. It is one of the best Askimet alternatives I have tried so far. Although I don’t believe that any anti-spam plugin is perfect, this one comes closer than any other I have tried. 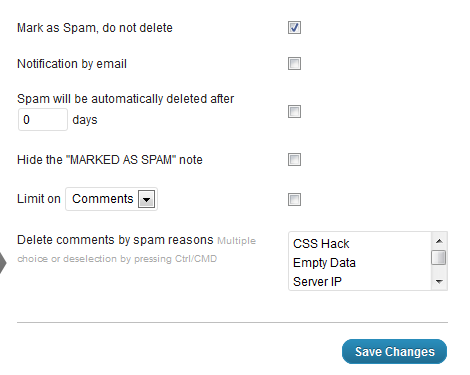 And, since the anti-spam check is done on your own WordPress site it makes it even more appealing. 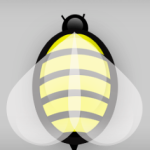 If you have been struggling with WordPress spam, or if you are looking for a good Askimet alternative I would definitely take the time to check Antispam Bee out. 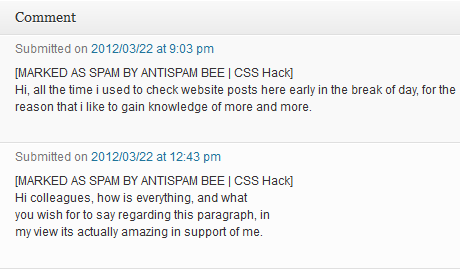 It appears that Antispam Bee may affect some WordPress themes that are using the CommentLuv plugin. That will make the CommentLuv rss links display wider/better for some WordPress themes. Clear cache if you are using a cache plugin. Second visitors appear to have to check the CommentLuv box when using this plugin. If it is already checked they would need to uncheck it, then recheck it in order for CommentLuv to find the latest posts. 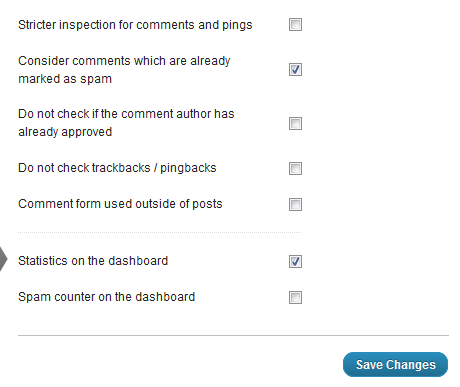 A work around is go to CommentLuv in WordPress dashboard. Settings/CommentLuv. In the top part of CommentLuv where it says enabled yes find: on by default? and uncheck it, then save settings. This will simply remove the check box in your comment form for CommentLuv and once a visitor checks the box it will search like usual. I actually prefer the box unchecked. People that are familiar with CommentLuv will know what it is and check it anyway. It appears that Antispam Bee may affect some WordPress themes that are using the CommentLuv Premium plugin. Give it some time to work. I have had good luck with it so far. It is still a little early, but so far so good. I have been manually emptying the spam folder, but you could always set spam will be automatically deleted after 7 days or something in the advanced setting if you decide to keep using it. That way any spam 7 days or older should automatically be deleted, which should also give you enough time to inspect them before they are deleted. This plugin works fine til now. Been using for almost 2 months and I don’t see spam that much anymore. Are you saying it still works decent for you? Or, that it did up until now? It continues to work well for me. I still get a few here and there, but that happens with any anti-spam plugin or feature. You can’t catch them all everytime. Askimet doesn’t catch them all either. Wow! Thanks for this nice review, I think I’ve just found a better solution than Akismet, thanks for the useful information! Thanks for sharing with details explanation. Much appreciated. 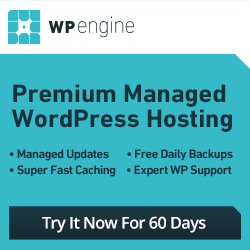 This is the best alternative of Spam Free WordPress, but I think we should choose either 1 to install instead of install both to avoid slow down the WordPress. Probably not a good idea to use more plugins than you need. Some will even conflict with one another. I am also looking for an alternative to Akismet and these are worth considering. Thanks for the review! This looks cool. I love the name too ‘anti spam bee!’ sounds awesome. In your opinion, does this work well to guard against viruses? Or is it just average? I read a few reviews that didn’t favour it very well. I don’t think your going to see any virus protection with Antispam Bee. It’s primarily an antispam plugin. I have seen a few plugins that claim to help prevent viruses, malware, and other exploits. There is also security and firewall plugins out there too, but I haven’t tried them. Cloudflare and Incapsula are supposed to help for these kinds of things as well. Other than that make sure your scripts, plugins, modules, and those kinds of things are up to date and patched especially when a security update is involved. Nice to know Antispam Bee has worked out well for you. I’ve been curious about a good alternative to Akismet for sometime. Platforms like Disqus and Livefyre are nice but they require signing up by the user. I’m going to give Antispam Bee a try. I don’t have a problem with Disqus or Livefyre, but I don’t like signing up just to comment on something. I prefer the traditional WordPress comment system. Antispam Bee continues to work well for me. A few slip through every now and again, but that happens with any antispam plugin. WordPress spam is really annoying and this antispam bee gives great result.Thanks for the detailed post on how to prevent wordpress spam with antispam bee. You got that right. WordPress spam is one of the biggest pains and it can be very time-consuming to deal with. I also tried Askimet and it has good result but thanks for sharing review on its alternative. Askimet seems to be very popular yet. Some people look for free alternatives to Askimet since you are supposed to pay a monthly fee for it now if your website is business/commercial. Basically anything that is not a personal blog. First of all I say its a very nice review of this spam fighter plugin. I want to know how it is working for you guys. @peter @Dialme. let me know your views, is it better than GASP and aksimet. sahre your experience here. So far so good for me. I have been using Antispam Bee with GASP for 3-4 weeks now, and I don’t have any complaints. A couple spam comments slip through every now and then, but it seems to be stopping the bots and automated spam very well. I haven’t had a single false positive yet. I have read a few posts on other sites where people said it was marking some legit comments as spam. I just delete the ones that slip through since it only happens a couple times per week. The thing I like about Antispam Bee compared to Askimet is I get to see the comments marked as spam and I can decide whether they are spam or not. Askimet lets you inspect some, but not all of them. Lastly you are supposed to pay a monthly fee for Askimet if you have a commercial website, which from what I gather means if you have advertisements, affiliate links, or anything that you might generate income. Where Antispam Bee is free. Thats really nice. 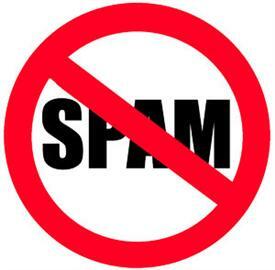 So if it is used with GASP then they can be the perfect combination to get rid of spam to a greater extent right? In my opinion GASP doesn’t work that great by itself anymore. You really need something else or something along with GASP. Whether it be Askimet, Antispam Bee, or something else. If you are happy with Askimet you probably don’t need to switch, but if you don’t have Askimet or if someone doesn’t want to pay the monthly commercial website fee that Askimet wants now, then Antispam Bee is a good alternative. currently I am using GASP with Akismet and I am pretty happy with them But Antispam bee seems to promising so wanna try it out. Any way Thank you so much for this conversation. As far as I’m concern, this is THE ONE! Those “marked as spam” comments are truely spam no mistakes! There are some slip through occasionally but very rare. Highly recommended! I need to change my spam settings too. Thanks for sharing this post with us. Spam can be difficult to keep up with, and oh how annoying it can be. I notice that it allow link in comment. May I know how or where to to remove link in comment? Thanks. You can use the WordPress…Settings…Discussion area to set Comment Moderation to hold a comment for moderation if a comment contains 1 or more links. Then, if a comment has a link it will be held for moderation / pending. You could then manually remove the link if you don’t want to allow it. I’ve been seeing a lot of these anti-spam plug-ins for WordPress, but I still see some spam go through moderation. You know those “thanks for the information” types? It makes me sad when I see those with the keywords on their names, while my comment doesn’t even go through even after a month. Do you use the Antispam Bee along with GASP and Akismet? 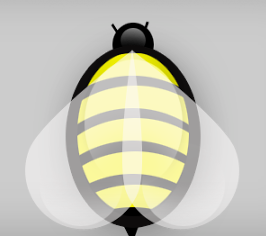 I am using Antispam Bee along with GASP. I don’t use Askimet. It continues to work well for me. I have a few spam comments here and there slip through, but for the most part I have been very pleased with the results. Great! Good to hear that it is still working well for you. I just wanted to make sure. Hopefully the plugin developer continues to update it as needed for new WordPress version releases. Thanks for your well researched blog on Antispam Bee WordPress Plugin. I am lucky to find it in right time. I am an electronics engineer from IIT, Kharagpur, India. I am a Web Designer. Hope to receive your post updates as soon as it will be published. If this antispam bee works, maybe I’ll give it a go… Thanks for the imput. It’s worth looking into and testing if you are looking for an alternative to Askimet. 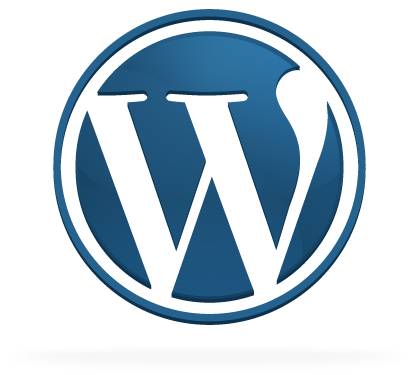 This free plugin is simply awesome and life saver for a WordPress blog. I am using another free plugin anti-spam with this to stop all spam comments. Many thanks for sharing this article.